The start of the school year is not going as the Fletcher brothers hoped. Each boy finds his plans for success veering off in unexpected and sometimes diastrous directions. And at home, their miserable new neighbor complains about everything. As the year continues, the boys learn the hard and often hilarious lesson that sometimes what you least expect is what you come to care about the most. 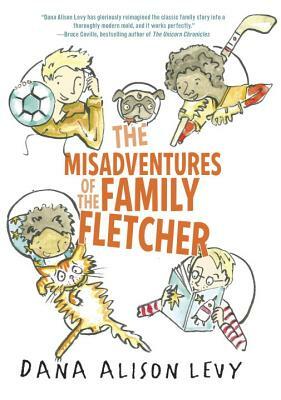 Praise for "The Misadventures of the Family Fletcher"
Levy provides a compelling, compassionate, and frequently hilarious look at their daily concerns. By book's end readers will want to be part of (or at least friends with) this delightful family. "The Horn Book"
Dana Alison Levy was raised by pirates but escaped at a young age and went on to earn a degree in aeronautics and puppetry. Actually, that's not true--she just likes to make things up. That's why she always wanted to write books. She was born and raised in New England and studied English literature before going to graduate school for business. While there is value in all learning, had she known she would end up writing for a living, she might not have struggled through all those statistics and finance classes. Dana was last seen romping around with her family in Massachusetts.